It’s an out-of-box media center kit based on Raspberry Pi. Raspberry Pi is the perfect device for build home theater systems. 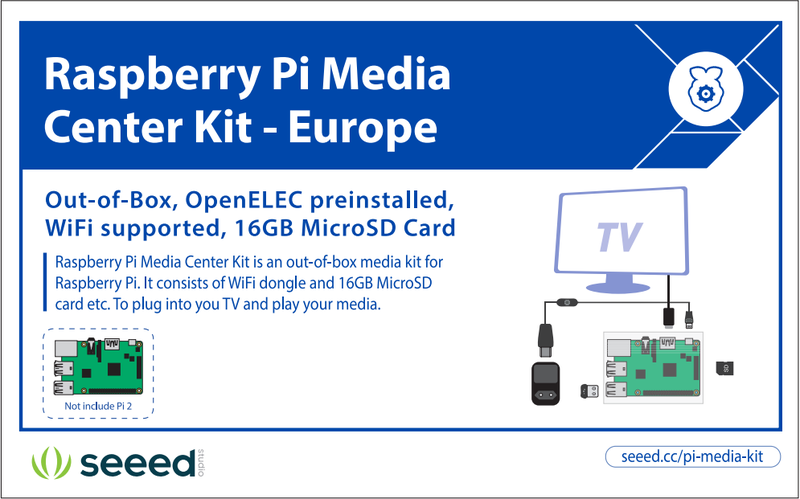 This kit is compatible with Raspberry Pi Model B+/A+/2, and the SD card pre-installed OpenELEC for Pi 2(Of cause, you can re-burn OpenELEC for Pi Model B+/A+). 5V 2.1A Power Adapter（Europe version): 2.1A Power Adapter is the good choice for Pi 2. Micro USB and HDMI Cable: There are a switch which USB cable contains is built-in, so you can turn on/off easily. And the HDMI cable is 1.5 meters length. WiFi USB Adapter: Network devices, wire or wireless. Hardware is compatible with Raspberry Pi 3.